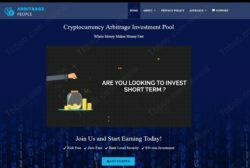 Arbitrage Poeple claims to be an investment program that makes money thanks to arbitrage trading. By investing with them you allegedly can make about 2.1% daily on your investment, which is more than 60% per month. Can this be real? The thing with arbitrage trading is that it is real. Sometimes there are different prices of the same asset on different exchanges, so you can buy a cryptocurrency on one exchange and sell it for more on another exchange. But it is impossible to make consistent returns every day, because arbitrage opportunities are not consistent. What is even more important is that arbitrage trading is not scalable, it is always limited by the depth of market. In other words, you cannot get more people into the program and reach the same profits for everybody every day, because the amount of mispriced cryptos is always limited. This makes clear the fact that Arbitrage People is a scam, it probably works as a Ponzi scheme, meaning they do no real trading. They just play with people’s deposits and the game is doomed to fail. Another giveaway is the lie about the age of the program, they claim to be active since 2016, but the website was created only in 2018. Arbitrage People is not a real arbitrage trading program, it is a scam that is going to collapse, stay away from it! If you want to try crypto trading, start on a free demo with a regulated broker. Trading is never risk free, so be careful if you decide to trade with real money.